This is a well-made concert film of Mastodon at their best. And the 23-song setlist covers their whole catalog. Mastodon’s second live release comes a scant two and a half years (and one studio album) after their first. Why follow the first one so quickly? Well, Mastodon’s tour in support of their 2009 concept album Crack the Skye featured the band playing the entire album straight through. The performances were backed by an elaborate video presentation that literally laid out the album’s story. Live at the Aragon was a CD+DVD package release that served specifically to capture that performance, and also included the backdrop film as a separate thing on the DVD. But those shows didn’t leave much room for the band’s other material. Once they finished performing Crack the Skye, Mastodon made a quick run through their earlier stuff, playing one song apiece from their earlier records. Live at Brixton is a much more inclusive show. It contains 23 songs from across the band’s catalog. This concert was recorded smack dab in the middle of the band’s tour in support of their 2011 album, The Hunter, so it’s naturally heavy on songs from that record. But the show also found the band playing five songs apiece from fan-favorite albums Leviathan and Blood Mountain, as well as a pair from Remission and another pair from Crack the Skye. This is a concert that will be familiar to anyone who saw the band on the initial tour for The Hunter. According to the contributors at setlist.fm, the set here is exactly the same as the rest of their European leg. For North American fans, the only difference is the presence of “Thickening” right in the middle of the set. Mastodon is apparently not the kind of band who likes to change things up from night to night. The video and audio presentation here is very good. Even the low-resolution video link supplied by Warner Bros. for review looks nice, so one assumes the high-res version is crystal clear. Sonically, the show is very, very loud, which is completely appropriate for Mastodon. The mixing is excellent, as each individual instrument can be heard at most times. Brent Hinds and Bill Kelliher’s guitars dominate the sound, but Brann Dailor’s drumming is also very high in the mix. Even Troy Sanders’ bass playing is audible much of the time, including when he’s doubling the guitar riffs but much moreso when he has his own individual bassline. Director Ryan Mackfall captures the band from a wide variety of angles and cuts between them appropriately. Guitar solos often get nice close-ups of Hinds or Kelliher working the frets. Dailor’s complex drumming also gets plenty of screentime. As strong as the axe men are in Mastodon, Dailor is frequently considered the star of the show, so it’s great to see so much of him calmly pounding away on his kit. The video utilizes a camera from right behind the drums so fans can see exactly what Dailor is doing in those shots. As for the setlist itself, this is a show that emphasizes the heavier side of Mastodon’s sound. After the more progressive, spacier sounds of Crack the Skye, The Hunter was an album that found Mastodon exploring a variety of sonic territory. But next to their older songs, the tracks from The Hunter that show up in this concert fit in quite nicely. The show opens with “Dry Bone Valley” and “Black Tongue” and follows seamlessly with “Crystal Skull” and “I Am Ahab”. The supremely technical workout of “Capillarian Crest” is an early show highlight, as is the punishing “Colony of Birchmen.” “Megalodon” closes out the opening salvo and the band settles into the middle of the show. For the encore, Mastodon brings up openers Red Fang and the Dillinger Escape Plan to join in a massive sing along of “Creature Lives”, one of the few blatantly goofy songs the band has ever recorded. But in the encore position, with hundreds of red balloons dropping and popping all over the audience and a dozen people onstage singing, the song becomes a joyful celebration designed to put a smile on everybody’s face. “Creature Lives” also highlights the elephant in the room (pun intended) when it comes to Mastodon: the vocals. Hinds and Sanders handle 90 percent of the group’s vocals, and both are mediocre vocalists on their best days. So live shows with Mastodon are a roll of the dice from a singing standpoint. But here they sound about as good as they can, and the mixing keeps the vocals from standing out. Sanders and Hinds are audible at all times, but they’re definitely mixed a bit under the instruments, which, with Mastodon, is pretty much how it should be. The exception here is Dailor, who is actually quite a solid singer. Whenever the band plays a Crack the Skye or Hunter track, Dailor’s singing noticeably improves the sound of the band. But it’s Mastodon, and if you’re enough of a fan to spring for this digital-only release, chances are you know going in that the vocals aren’t going to be the highlight of the show. Similarly, the visual presentation of the concert isn’t all that impressive. Unlike the Crack the Skye shows, this concert found the band playing in front of a large scrim that simply had the cover of The Hunter on it. Lighting-wise, mostly the band is covered in single colors of light depending on the song. It’s usually red, green, or blue. The band has about a dozen smaller lights that are used for emphasis and occasionally fancy moving light schemes, but that effect is muted on video because the focus is so strongly on the performers. The viewer only gets to see the light show when the video cuts to a wide shot of the band, so it all seems a bit bland. But Mastodon has a reputation as a no-frills metal band. A cool light show isn’t the selling point here. This is a well-made concert film of a band playing at their best. And the set covers their whole career. 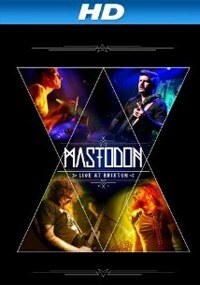 Which is really all Mastodon fans should need to be pleased with Live at Brixton.